McAlister’s Toulouse earned a victory over Clermont at the weekend, with the former All-Black kicking 15 points, but after the game he was still being questioned about a try that nearly didn’t come about because of a decision he made in the heat of the moment. Possibly intimidated by the line of questioning and possibly taking his cue from Joey’s linguistic exploits last week, McAlister’s accent took on a native twang when he gave his response to the questioner. McAlister’s bit of ‘Frenglish’ is nowhere near as bad as Joey Barton’s accent and not even on the same level as Schteve McLaren’s double Dutch, but it’s still bad enough for McAlister to cringe when he has a listen back and for his team –mates and friends to have a good laugh at his expense. Bryan Habana’s spectacular try against New Zealand in the Rugby Championship has won him the International Rugby Players’ Association’s (IRPA) Try of the Year award. Habana, the IRB Player of the Year in 2007, stunned the All Blacks when he ran onto a pass at full speed, chipped ahead and gathered to score a try that briefly handed the Springboks the lead seven minutes into the second half of the contest in Dunedin. New Zealand went on to win 21-11. “Scoring a try against the All Blacks is always special, but scoring against them in New Zealand, is even more special,” said Habana. “I really enjoyed getting across the try-line in Dunedin – contributing to the success of the team and also lifting the spirits of my teammates. The New Zealand rugby team’s pre-match Haka is one of the most iconic sights in sport. But when the All Black Maoris faced Leicester on Tuesday night they took the ancestral war dance to new heights. The players were warned that the Maori version is a cut above the fearful routine the All Blacks perform before Test matches – but nothing could have prepared them for this. As part of their two year partnership with Mind, the mental health charity, London Wasps are proud to be highlighting World Mental Health Day on October 10th. It’s vital we all talk about mental health. Let’s start today! Armchair rugby supporters will get the chance to see the All Blacks, Australia and France in action on ESPN in November. Reports ESPN. 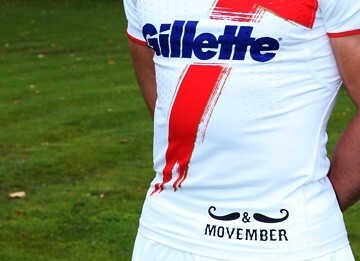 England Rugby League are to show their support for Movember by wearing a specially-commissioned playing shirt promoting the men’s health awareness campaign during the 2012 Autumn International Series.